As undergound DIY lables go, Art Is Hard Records is giving Alcopop! some strong competition. 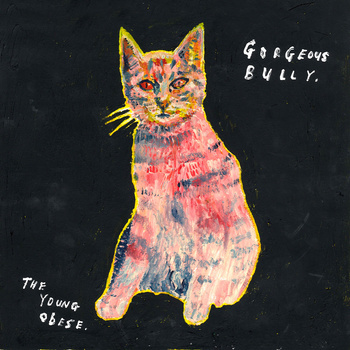 The Young Obese EP by bedroom popster Gorgoeus Bully is already their second cassette of the year – the first came from Mazes' Jack Cooper – and comes on top of a bi-weekly download/pizza CD release. As for Gorgeous Bully; you might remember 'That Kind Of Girl' – a Track of the Week from the end of last year, that set him up as a singer-songwriter type with a warm lo-fi sound that verged on country. Well this demo sound has been expanded on for the full EP that features five tracks that retain his lo-fi appeal but add plenty of noise and pop nous. From Phil Spector to Yuck there's some disparate reference points for The Young Obese . Opening song, and free download, 'Never Cry', for example buries a festive feel in it's fuzzy wall of sound and comes across as both pretty and bleak, like nostalgia beamed back from an alternative apocalyptic future. Or perhaps someone reconstructing a Pipettes song from a thousand destroyed tapes. This is followed by 'Stamp' which is perhaps the highlight of the release and wonderful from the off. With a similar faded glamour that we heard from Big Wave there's the echo of a memory and some surprisingly emotive force in the lyrics “I just want to tear it down.”. Like noise-pop acts such as No Age there's colour in the fuzz and the clattering and oddness of arrangement, that's distinctly ant-pop resonates in an oddly striking way. 'Who Do You Think You Are' (unsurprisingly not a Spice Girls cover) is the rocker moment on the release. Although there's a pop song at its core it's buried down there with the guitars dissolving into noise on top for a grungey feel and pounding drums that ensure the head bobs more than slightly. It's on this and 'Quiet House' that the aforementioned Yuck and Bos Angeles are both recalled. With lyrics such as “I just wanna lie in the lounge all day” the listener is instantly transported to teenage days of oppressive summer heat and a broken 90s soundtrack.